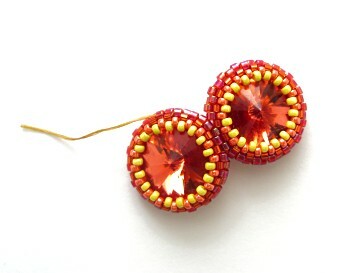 This series began after some experimentation beading around crystal rivolis. I had an image in my mind of what I wanted to create but found it incredibly fiddly to bead and it was really trying my patience! So as I beaded it I kept getting frustrated by it not working and doing what I wanted it to do and had to keep reminding myself that I do enjoy beading really! Those thoughts led onto me thinking about what do I enjoy about beading and remembering that it is the joy of imagining a piece of work and having it come to life in your hands. Or, as Onye Ndika said "I believe that what makes us artists is that we are passionate about birthing beauty from the works of our hands." Throughout beading this piece I had that phrase "birthing beauty" in my head as a mantra to keep going, no matter how annoyed I got with it, so it's only right I call it Onye. Since beading the first pendant I have continued to experiment with it and hope to continue to do so. Instructions for thse pendant are available here.